Filbur pool and spa filters are made to match the exact OEM specifications. They are made with Reemay™ polyester filter media, durable polyurethane end caps and reinforced PVC center cores. The filters feature sharp pleat folds to eliminate bridging and allow dirt to penetrate deep into the pleats for better flow and easier cleaning. Perfect for consumer and industrial pool applications. Low Maintenance. 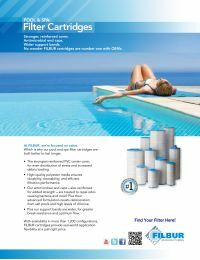 Cleanable & reusable, the FC-0820 Pool Filter Cartridge requires fewer filter replacements, resulting in less hassle and maintenance. More Surface Area. A larger surface area not only optimizes performance, but extends the life of the filter cartridge. Premium Polyester Filter Media. Polyester provides clearer, cleaner water. Antimicrobial End Caps. Reinforced antimicrobial end caps ensures strength against bacteria and resistance to deterioration from salt and chlorine. Measure the old filter that needs to be replaced. Take note of the length of the pool/spa cartridge, from end cap to end cap. If possible, also measure the outside diameter. If the cartridge is open, measure the inside diameter. Where possible, note the media material (polyester, polypropylene, cellulose, etc.) of the filter. This may be listed on labels, cartons, or on the filter itself. Examine the pool filter housing. Is it a single or multiple cartridge housing? Multiple filter housings often have springs, allowing for a slight variation in cartridge lengths. Single housings often require specific cartridge dimensions. NOTE: Our pool and spa filters are made to meet or exceed OEM filters. For help selecting the right filter for your pool or spa, call us at 1-877-335-3339. Our water experts will be glad to help you.